Micro-blading is a method of applying semi-permanent makeup. 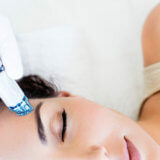 How does semi-permanent makeup work? Semi-permanent makeup involves having pigment implanted into the epidermis using a fine needle – similar to a tattoo but the process is less painful, the “ink” used is usually mineral based and the results are not permanent. When it comes to having micro-blading done, a technician will take six measurements on your brow bone to make out the perfect shape for your brows. The process usually takes between one and a half to two hours and at least one touch up will be needed to get your final result. 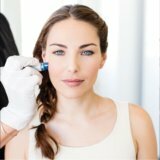 The healing process is relatively quick – but final results may not be visible until several weeks after your appointment because of how the skin heals. This is for Permanent Make-up, so separate from Microblading. I would like it placed below the Microblading section on the page please.